The best four days of gaming in the bay area are over and done. 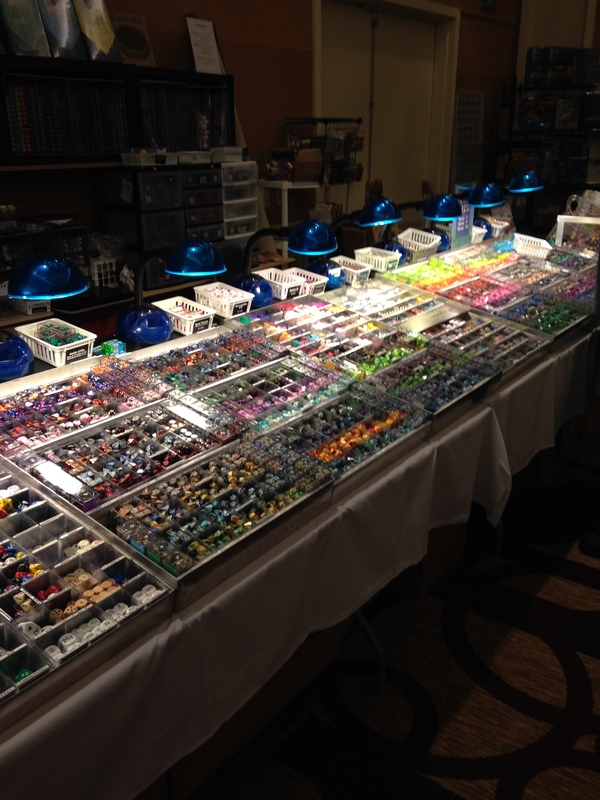 Kublacon 2015 was a blast. 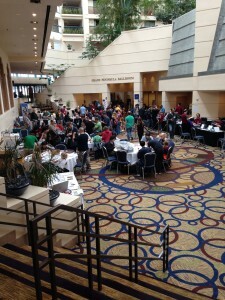 Good dealers, games, and seminars. It was great hearing tips from the proverbial horse’s mouth: James Earnest. I managed to make it to two lectures, one on how to sell to publishers and one on how to publish yourself (Hint: Don’t do it!). But that’s not why you are here, is it. How did the games go? After some initial problems with my game being scheduled at the wrong time, Gladiatron got a table and was set up. Gladiatron is a gladitorial combat game I have been working on, specifically for convention play. 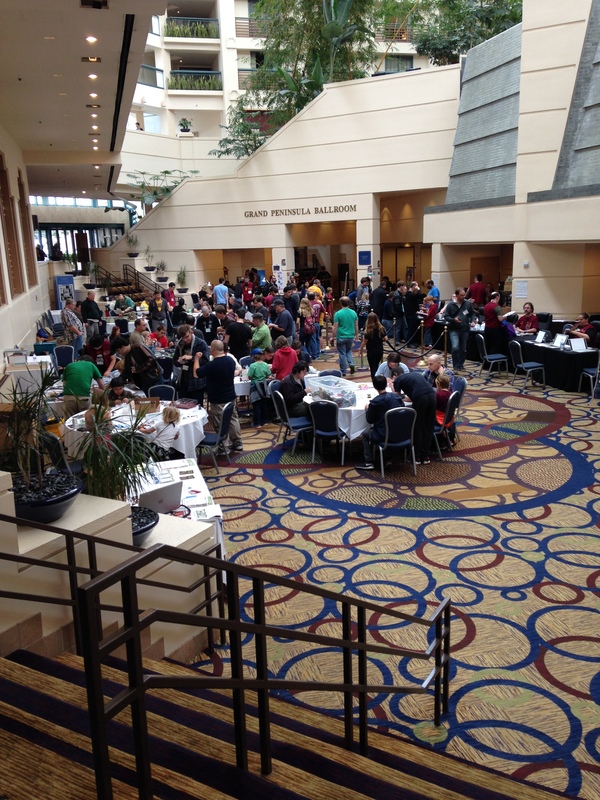 Every year, the lobby of Kublacon is filled with big, flashy games. I wanted Gladiatron to be one of them. More specifically, however, I designed it with drop-in, drop-out gameplay. Each player plays a gladiator trying to score as many points as possible. Points are scored by attacking other gladiators, standing on Podiums of Power, or grabbing the trophy in the middle of the arena. If you escape, your score is put on the leaderboard, and at the end of the game, the highest score wins. If you are killed? Well, you gave it your best shot, right? The leaderboard allows players to play a run or two and leave, or show up late, and still have a chance at winning. So how did the playtest go? This was the third year I had run the game. When the game was first made, I drew inspiration from League of Legends, and other MOBA games. Each hero was represented by a hand of cards and a hero sheet. The hero sheet had a passive ability, a health total, and a number of rerolls per turn (usually 2). The hand of cards represented all the hero’s possible actions. Usually, each hero had a move, an attack, a refresh action, a special action, a defense, three special abilities, and an ultimate ability. Players could take 2 actions per turn, and could not overlap types of actions. For example, they couldn’t play two attacks, or two moves, or two special actions on the same turn. The purpose of the action type limiter was to prevent overly explosive turns, where someone runs around all defenders and reaches the exit, or doubles down on damage and eliminates someone out of the blue. The second year was a polished version of the first, with re-balanced, and new, heroes. This system had several problems. First of all, the action type limiter was unclear to new players. That part of the rules took several minutes to explain by itself, and mistakes were often made during play. In addition, there were too many cards per hero. With 9 possible actions, four of them ostensibly better than the others (special actions “exhausted” after use, and required a refresh action to ready again, so they were essentially worth double), there was no need to play strategically. As players could only play one special action per turn, they would try to unload their special actions as fast as possible, keeping nothing in reserve. Even more frustratingly, it worked. Players rarely lasted more than 4 turns in the arena anyway, so there was no reason to conserve your more powerful abilities. The downside of requiring a refresh effectively made them single use. Other problems revolved around the Defense action, which never felt fun. You needed to defend on your turn before you were attacked, so if no one attacked you, your action was wasted. If you were attacked, the attacker got less points because you negated some of his damage! For the new version, I decided I wanted to start over. The move and attack actions had to stay. After some thought, I kept the defense action, but made it more reactive. Now, damage scores the attacker points immediately, but the defender does not have to choose to respond until their next turn. Instead of resolving it immediately, the damage is marked in an “oncoming damage” pool. The defender may choose to play a defense action as their first action on their next turn. If they do, they reduce the damage from the “oncoming damage” pool. If they not, they still get their (much lower) passive defense. This worked out much better than I anticipated. There was very little confusion on how damage worked, and this helped prevent the flow of play issues associated with the old system, where people had to pass dice across the table to roll defense out of sequence. The only problem with the system was that people often forgot to “take” the damage during their turn. It was easy enough to rectify afterwards, but a player aid would make this more clear. When the next prototype is generated, the “oncoming damage” pool will be placed between the two slots for action cards, which should serve as a simple reminder to take the damage. I really wanted to focus on the special abilities and refreshing. That was, I felt, where the meat of the game lay. Actions, once used, still exhaust, but now there are only two of them, instead of three, and the ultimate was removed. This made each of them more important, while still giving players choice. The refresh action was combined with the special action from before, and varied based on the playstyle of the gladiator. Some just play the refresh action to refresh an ability. Others refresh automatically, or when they manage to land a special attack. It ended up making each gladiator feel unique, although the three hour session was not long enough to determine balance. So was it better? Yes. Unequivocally. Cutting the card pool from 9 to 6 sped up play, but players still felt like they were making interesting, meaningful choices. Before, a run could take 60 to 75 minutes, but with the new system, it was down to 45. My eventual goal is to cut it down to 30, but that’s going to be rough, if it is even possible. Eliminating the action type limiters didn’t hurt the game at all. Because there were less actions, the “doubling up” only rarely occurred, and didn’t feel punishing. The damage of attacks had been lowered, so average run length was increased to around 7 turns, which gave players a chance to refresh several times, which in turn made action use more strategic. Overall, I think the new version is much better, and will need to vary the roster to fulfill the promise of characters from any genre. 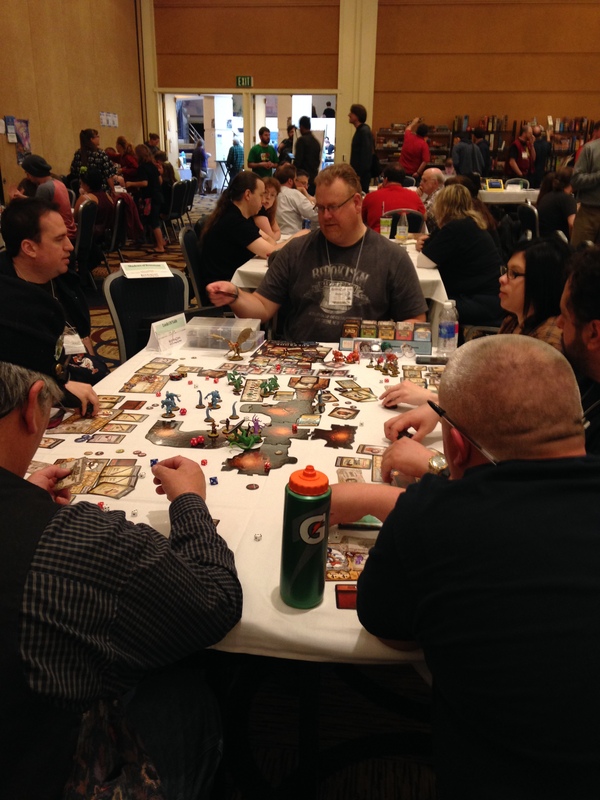 Kublacon lets you bust out the big games. The other game I ran was Agents of SMERSH. You can see my review of that game next Friday at noon. Agents of SMERSH is a storytelling board game of spies in the cold war. Definitely a departure from your normal worker placement game. Gladiatron was not the only game I managed to get some playtesting on. I ran several variations of Council of Kings. My number one piece of feedback from the Protospiel was that there “weren’t enough heroes”. I got the same comment time and time again. How could that be? There were the same number of heroes and villains in the deck! After some investigation, the real answer appeared: the point of the game was not obvious on a first playthrough. Players refrained from taking monsters, instead waiting until they had a hero before they took the risk. But without taking the monster, they were never able to afford a hero! So their supplies steadily dwindled, while those that took risks scored big. Perception is, however, reality. It doesn’t matter if the game is balanced if no one sticks around for a second game, so I was determined to do some additional playtesting. 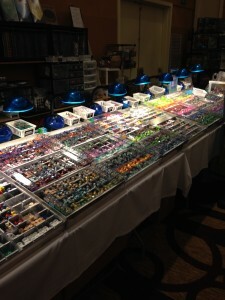 The Chessex booth always draws a crowd. I developed two variants I wanted to test. The first was “Starting Heroes”. In this variant, players were given a hero from the beginning. I tied the goals in with the hero, so some were better for the short game, some for long, some had less Order but more starting Favors, etc. I want to say it was a disaster, but what it really was was boring. When every player had starting Order, a number of punishing monsters, like the Troll or the Doppleganger just became mediocre. They went for less money, and the game was less interesting for it. My goal is to have every choice matter, and it made the first half of the game dull, so they were cut. The other variant I wanted to test was “Population”. At this time, there is no penalty to waiting to defeat Monsters until the end of the game. Players felt that was wrong: They liked the monster killing aspect, as much or more than the economy aspect. So I decoupled money and points. Whenever an Omen was revealed, a special auction was held for population. Population were victory points. Whenever an Omen appeared, players lost population equal to the number of Monsters in their Kingdom. It worked, and probably better than the “money is points” version, but… It was slower. Less snappy. Introducing up to 16 additional auctions in the game added another 15 minutes to playtime, and they weren’t exciting minutes. Money felt less exciting to get, and sending around that Monster for just one more coin lost its appeal. I did enjoy the penalty for Monsters on Omens, so after I scrapped Population, I added Darkness counters, which are effectively the same penalty. I am glad I got the testing in with the variants, because they taught me an important lesson: Take what people are saying to heart, but know that they can be wrong, too. The game works best without any of the fancy additions. Easy to learn, difficult to master. By adding actions to the Omen cards, I can add penalties to those with Monsters without adding in additional components. 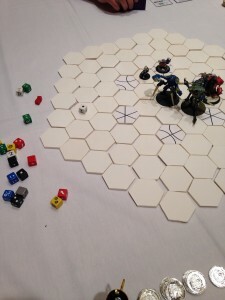 This entry was posted in Development, News and tagged Gladiatron, Kublacon, Playtest.